Although soccer fans have seen a solid number of card sets over the past few years, they've been primarily targeted at set collectors and more value-driven content. 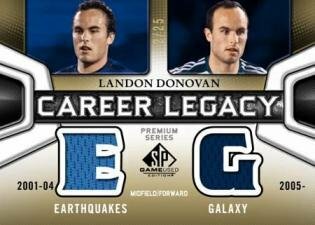 That changes with 2011 SP Game-Used Soccer from Upper Deck. The high-end release includes an autograph or memorabilia card in every three-card pack as well as a rookie card numbered to either 499 or 99. Among the highlight hits are game-used name plate letter patches, multi-autograph cards, and dual- and triple-memorabilia cards. 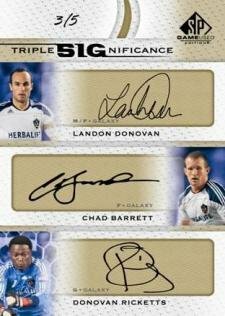 This extremely limited set boasts a checklist with many of soccer's biggest names, including Landon Donovan and David Beckham. It also has the cardboard debuts of Charlie Davies, Pavel Pardo and Benny Feilhaber. 60-card base set with 16 Authentic Newcomers numbered to 499 and eight Authentic Newcomers numbered to 99. Charlie Davies, Pavel Pardo, Benny Feilhaber, Juan Agudelo and Alex Morgan among the featured rookie cards. SIGnificance autographs have up to three signatures. Inked Fabrics mix game-used memorabilia and autographs. 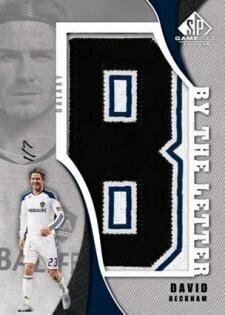 Memorabilia highlights include By the Letter Game-Used Name Plates, Career Legacy dual and triple memorabilia cards and Supreme Fabrics with jumbo patch swatches.